In August 1966, Temple Sinai’s Rabbi Theodore Ross traveled on behalf of his congregation to Mount Sinai in Egypt in search of four pieces of granite for their newly built sanctuary. Once selected, Egyptian stone-cutters cut the 1,600 lb. 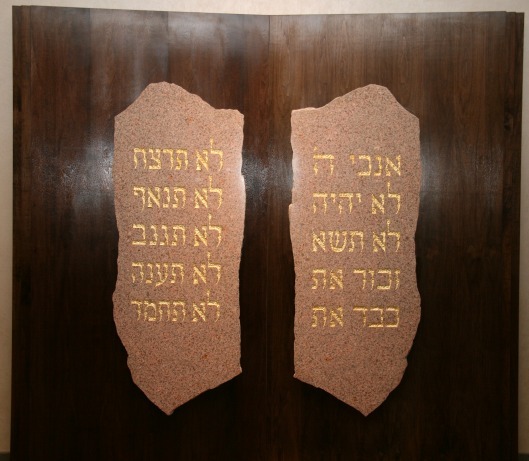 slab into four tablets and engraved each pair with the Ten Commandments. Once they were completed, they were returned to New York. One pair was installed permanently into the exterior of the synagogue. The second pair of tablets is now at home at The Reform Temple of Forest Hills. Their beauty now welcomes us as we enter the sanctuary, and reminds us of our past and celebrates our future. Another small piece of granite was given to our neighbors of the First Presbyterian Church of Forest Hills with the words of gratitude. This generous church opened their doors for worship on Friday nights to the members of Temple Sinai for seven years until their own building was completed. This friendship is still strong today.